Is it a test? Or is it a real, new feature? Either way, we can confirm that on both Android and iOS, a new “Don’t play this artist” option is now showing up when you tap the three dots on an artist’s page. Strangely, when asked directly by a user on Twitter whether this feature was available, Spotify claimed it wasn’t. The change was noticed by Thurrott writer Mehedi Hassan, who believes that they’re able to see the new option because of their beta access. However, we tested using a decidedly non-beta, free Spotify account in Canada, and we were able to see it on both Android and iOS. 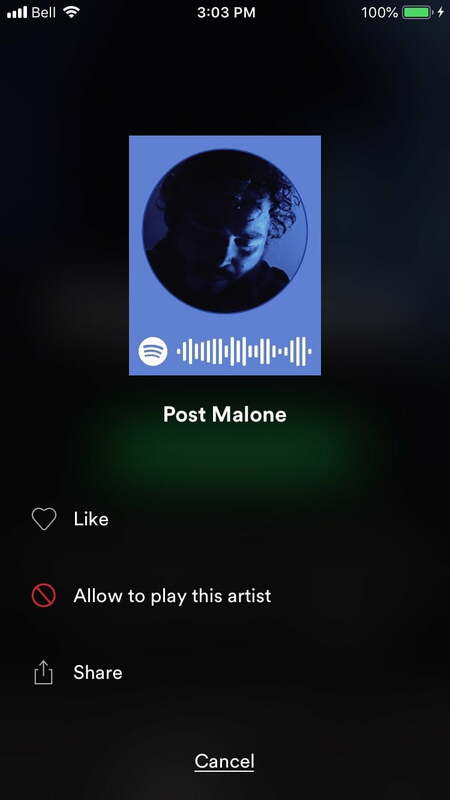 Hassan said you can use it to “block music from an artist on automatically curated playlists like Discover Weekly, your Daily Mixes, as well as things like global charts.” The new feature will not block artists on collaborative tracks where they are not the sole artist. After deciding to block an artist, a small “no” sign appears in red on the artist’s page, replacing the favorite heart. Undoing the block is as easy as tapping that no sign, or by tapping the three dots again and choosing the awkwardly named “Allow to play this artist” option. If this is accurate, it will give Spotify listeners an unprecedented amount of control over which artists are played (and paid) on the platform. It also means it won’t be long before the feature becomes a stick with which activists can punish musicians they disagree with, for reasons that can range from stated political views (e.g. Dixie Chicks), to allegations of criminal wrongdoing (e.g. R. Kelly), and everything in between. The move appears to be a compromise of sorts, in the wake of the company’s flip-flop on its policy on Hate Content and Hateful Conduct. When it initially announced this policy on May 10, 2018, it was accompanied by the news that R. Kelly had been summarily dropped from the service. But less than a month later, Spotify changed its tune, saying, “We don’t aim to play judge and jury,” after which it reinstated Kelly. “Spotify’s pathetic attempt at evading another public relations nightmare is only going to backfire on the streaming giant. Its new ‘mute’ function misses the point entirely: that R. Kelly, a serial sexual predator who has spent decades preying on young girls, is still continuing to profit off of its platform. 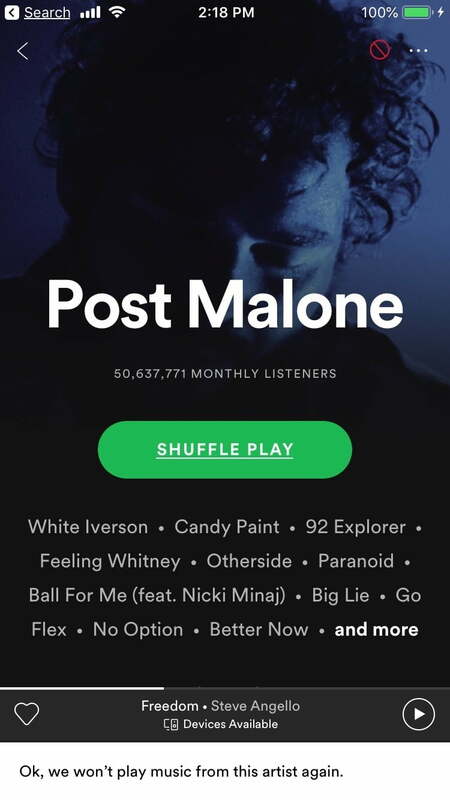 Spotify listeners have been asking for this feature for several years, and it was looking as though the company had no interest in making it happen. Given that music discovery is one of Spotify’s greatest strengths, it’s obvious why it had previously hesitated. Now that things have changed, we’ll have to wait and see what this means for both artists and music fans. Updated on January 22, 2019: Added reactions to the block artist feature and to clarify Spotify’s Hate Content and Hateful Conduct policy changes.